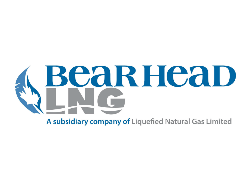 Bear Head LNG Corporation, a wholly owned subsidiary of LNGL, is developing an 8 mtpa or greater LNG export terminal in Nova Scotia. The 327-acre site is located on the naturally deep waters of the Strait of Canso in Point Tupper, Richmond County, Nova Scotia. The Bear Head LNG export terminal location is about half the shipping distance to major European markets compared to U.S. Gulf ports, and is closer than its North American competitors, including those in British Columbia, to other major LNG markets including burgeoning natural gas markets in India and Argentina.